24 mm 18K white gold case set with 48 cut diamonds (approx. 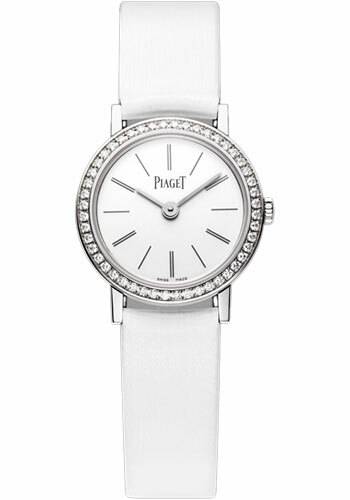 0.4 ct), 5.4 mm thick, diamond bezel, white dial, 690P quartz movement, white satin strap, ardillon buckle. Water resistant to 03 ATM. 24 mm 18K white gold case set with 48 cut diamonds (approx. 0.4 ct), 5.7 mm thick, diamond bezel, gem set dial set with 180 cut diamonds (approx. 0.6 ct) with hour markers in 18K white gold, 690P quartz movement, black satin strap, ardillon buckle set with 13 cut diamonds (approx. 0.04 ct). Water resistant to 03 ATM.